Game of Thrones Season 7 returns July 16 at 9 p.m. and the world can hardly wait. This is the penultimate season of Game of Thrones, with only seven episodes instead of ten. Creators David Benioff and D.B. Weiss, with input from author George R.R. Martin, will have to pack a lot of story into those seven hours. We’ve waited more than a year — a long, long year — for new episodes. If you can’t remember what happened, this Game of Thrones Season 6 recap will catch you up with the most important events. Cersei blew up Margaery and the High Sparrow, as well as a ton of other people. She also lost her last remaining child because Tommen stepped out his window, and plummeted to his death, after hearing the news of Margaery’s death. Cersei now wears the crown. Ramsay Bolton was eaten alive by his own dogs after an exhausting and bloody Battle of the Bastards, which was saved by the Knights of the Vale. Ramsay had kicked off the battle by shooting an arrow into Rickon Stark, as Jon Snow and Sansa Stark watched. The Starks are once again wardens of the North. Ellaria Sand and her Sand Snakes assassinated Doran Martell, and his heir, to take control of the throne in Dorne. Subsequently, Dorne was thinking about allying themselves with Daenerys (both parties hate the Lannisters). Euron Greyjoy came back from being presumed dead to kill his brother and take over the Iron Islands. Yara, who is eyeing the throne, and her recently-returned brother, Theon, took the best ships from the Iron fleet and offered them to the Mother of Dragons in exchange for agreeing to help them kill Euron, and to give the Iron Islands independence when (if) she takes the Iron Throne. Samwell Tarly is in Oldtown, studying to be a Maester. He and Gilly made a pit stop at his family seat on their way, where they were treated miserably. Jon banished Melisandre after finding out she burned Stannis Baratheon’s daughter, Shireen, alive. 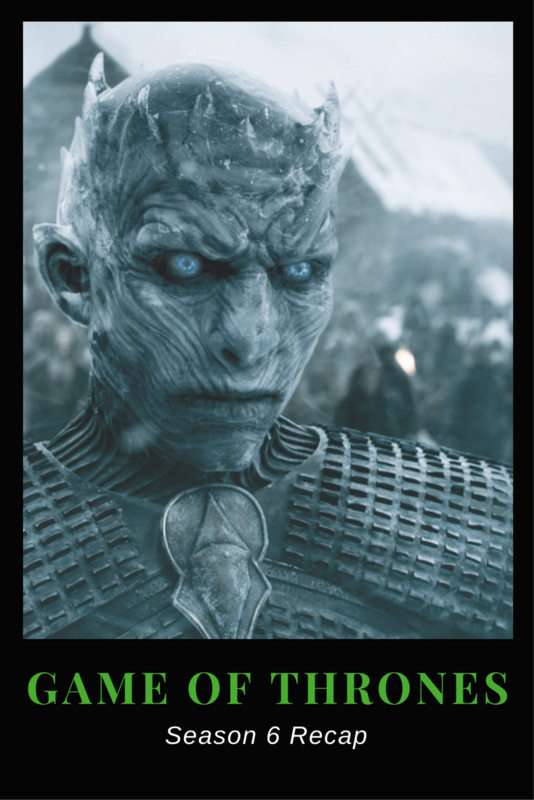 To cash in on the hype in the run-up to the Season 7 premiere, I wrote a list of the 15 Deadliest Weapons on Game of Thrones for Comic Book Resources. The list required more research than I thought it would. The research was interesting, however, and helped me recap Game of Thrones Season 6. Check out the list to help you remember some of the more gruesome deaths and how they happened. Thanks for reading! Sign up for our newsletter to get blog posts before they’re published.